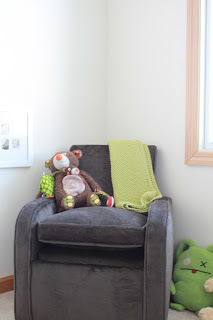 I screwed up a bit in trying to stretch the baby room into three posts because I showed all the good pics of the room yesterday so this is a bit redundant, but I'm going to call out what we have in the room. 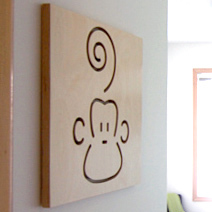 Marcel the Monkey from Design Public. We put the wood square so it's at eye level for our baby when we walk in the room holding it. Lot's of stuff here. The paint color is Robin's Nest from Benjamin Moore. It's no VOC but if I had to do over I'd have Sherwin Williams match it in their no VOC Harmony paint. I like the folks at my Sherman Williams better and stuff I've used in the past had better coverage than the Ben stuff. The wall shelves and cube bookcase are from a super exclusive Swedish design store called Ikea. We went there because it fits our design sense and because it's pretty inexpensive, plus their quality is much better than it used to be. We also want to let our room evolve with our child so we didn't want to lay down a lot of cash on things that could be soon dumped. The shelves are Lack and the cube bookcase is Expedit. The bins on the Lack shelves are actually from Lowes. The Expedit bookcase fits our changing table really well. The bee is a Prince Lionheart Wheely Bug . They come in two sizes, we got the small one. It also comes as a lady bug or cow. The black dot is an awesome print by my friend Jesse LeDoux. He created it so at 3 feet away it appears to be just a black dot on white. When you're closer than that you see that there are eyes, nose and a mouth on the dot and some awesome intricate white illustrations on the white. Hard to explain but check out Rotofugi where you can see what it looks like. Buy some LeDoux prints. You might look at this and worry that there is so much stuff out that the our baby can get into. 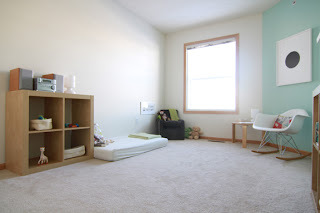 We're taking a Montessori approach to our room so things will be available to our baby. We will re-org stuff as our baby starts crawling to get rid of choking hazards and such and make sure everything at reach is age appropriate. I talked about the chair in an earlier post. 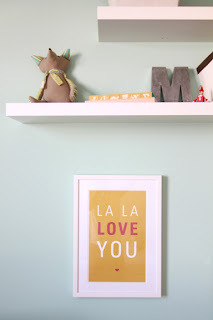 The La La Love print is from Etsy. I like the design but honestly I'm underwhelmed by the print. The paper is nice but up close you can really see that it was printed from a printer...I'm a print snob. It was only $15 but I'd be happy pay more for a screen print. Still not bad for the cost...just wish she'd pull some screens. The frames for this and the LeDoux print are from American Frame. Great prices, great quality and they ship to you quickly. Only downside is the have to use plexi vs. glass because of shipping. The metal M (for Matzoh or whatever the name is that we picked) is from Anthropologie. I talked about the fox earlier. 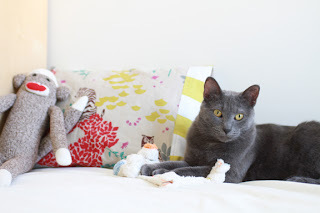 The cat, Zoggs, is from Petco at one of their adoption days. The place that had him was the same one we got Kalli from. It's called Adopt-a-Pet and is in Buffalo, MN. but I can't find a website. The awesome pillow in the back is the same design as the one on the rocker chair. We picked out the fabric and a good friend made it. They're awesome and I keep telling her to go on Etsy. We separated the sides a bit by color. Robin's nest is for play and exploration, random off-white color is the sleep side so it has less going on. There is another Expedit bookcase. The CD player will be replaced by speakers for our babies first iPod Touch. The Lykta lamp that is a bit hard to see is from Ikea. It's a cute white glass lamp that gives off some good light. As I said really early on we're doing a floor bed. I know I said I'd explain the whole deal and I didn't yet. I promise there is an 87% chance I explain it next week. Any way the mattress is a Sealy made from soybean foam. We're going to add some art or mirrors to that side. This chair is a one-of-a-kind. Staci's great-grandfather owned a furniture store and the had small samples of the furniture in the window. Not sure how it was originally upohlstered but it became Staci's dad's chair and was recovered in a tan pleather with fake cowboy brands on it...Roy Rogers was popular at the time. Then the chair beonged to Staci and her brother. Now it's been recovered and will be our babies. It rocks which is cool. Also it's the same exact color as Zoggs and he loves sitting in it so it's fun to see just his eyes at times. I wrote about the bear earlier. 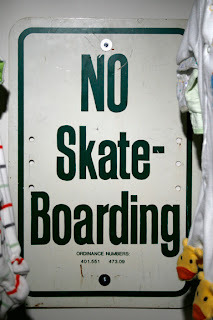 The no skateboarding sign is behind some of the clothes in the closet. It was borrowed a long time ago...longer than the statute of limitations. I was a freestyle BMXer growing up...all my friends were skaters...still I want my baby to know the law of the house. It is however one rule that I'd be OK if it was broken. The closet (no pics) is the Rubbermaid "Configurations" closet system from Lowes...it was super easy to put in. The have 2 different kinds of Rubbermaid closet systems...get the one that has a track at the top. It's like Elfa but 1/3 the price. This was supposed to be a quick low down of the room but it was longer than I thought. Well...hope you all like it, we love it. 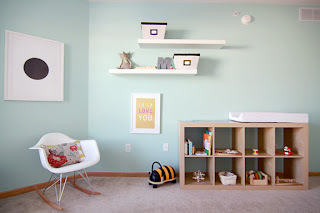 This is seriously the most favorite baby room I have seen! I love that it isn't full of zoo or safari animals and is just a simplistic baby room. I'm definitely going to borrow some ideas :o) Good luck to you both! hello! i've checked out your blog a few times (found it on top baby blogs, also my real-life best friend mandy of harpers happenings gave you a shout-out) and i just wanted to stop in and say i really enjoy your stories and photos! looks as though your little nugget will be arriving quite soon - well this room is adorable beyond reason! can't wait to see pics of your new little one, all cozy in possibly the cutest nursery i've ever seen. cheers! Adopt-a-Pet website is actually an easy one to remember http://www.adoptapet.com/ I have the link on my website and love it when people adopt. I've never heard of a floor bed before. Very interesting! Thanks all for the comments! Glad you;re digging it because it is pretty different so I wasn't sure of the reception. Staci learned about the floor bed in her Montessori training, she's a teacher, so we're gonna try it out. I promise I'll write about it next week but that's a tough post because it's a whole theory I don't want to screw up...expect a lot of plagiarism, I mean attribution. Love this room! I love the Montessori approach you incorporated. Would you mind sharing the name of the fabric you chose for the pillows? Last post before we're parents. Furniture: This is a post with no words.